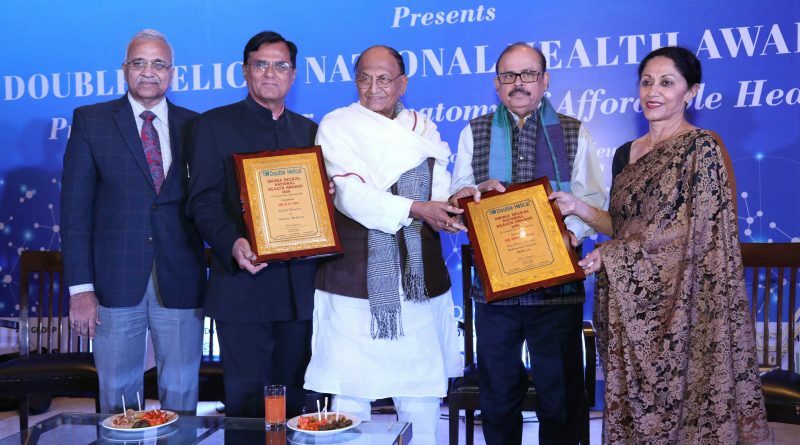 Dr.(Prof.) R K Tuli receiving National Award from Dr. C P Thakur, former Union Minister of Health for Excellence in Pioneering Holistic Medicine in India and highlighting its benefits for "AFFORDABLE HEALTH FOR ALL" - "SOHAM"
According to the Vedic saying, “Dharmartha Kama Mokshanan – Shariram Mulamuthamam”, whatever we wish to achieve in life, whether education, success, wealth, fame, or long life, we first need health. We further need health even to rejoice the attained wealth or success. Health can generate wealth, but all the wealth can’t bring back the lost health! Finally, health is not only core to individual accomplishment, but progress and prosperity of a nation. The World Health Organization (WHO) defines Health as not merely absence of disease or infirmity, but a state of positive physical, mental and social well-being. Our Constitution promises health as state responsibility to every person in the country. 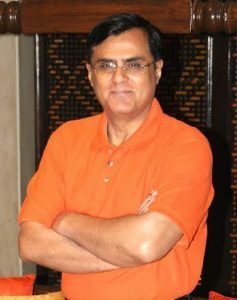 Since independence there has been a steady improvement in vital health indices and simultaneous development of a robust world class secondary and tertiary healthcare system in the country, enabling steady growth in medical tourism from neighbouring SAARC countries, Middle East and African nations. But we have lacked proportionate attention to primary, preventive and promotive care. As a result, there is a galloping increase in incidence and morbidity, especially attributable to lifestyle disorders, due to various diseases in the country. According to available statistics 4% of our population falls below poverty line annually due to out of pocket medical expenses by the sick. The objective “Health for All” cannot be achieved by healthcare delivery system, as endorsed by successive commissions, relying exclusively on the modern or allopathic system of medicine. Health is not achievable just with the power of money. The WHO-UNICEF programme “Health For All by 2000 AD” failed in its objective despite no financial limitations. The countries like USA who spend 16% of their GDP on health, compared to mere 1% in our country, have not been able to achieve the desired targets. Health cannot be achieved without ‘spiritual’ dimension being included as fourth dimension to physical, mental and social needs of the people as recommended by World Health Assembly in 1986. It has been universally agreed that to achieve health we have to adopt an all-inclusive and integrative holistic approach to enable positive physical, mental, social as well as spiritual well-being of each person, . This model of Holistic Medicine enables care of each individual as a whole ‘body-mind-spirit’ and thereby all the ailments of an individual concurrently, minimising dependence on medication and surgical interventions, thus significantly reducing load on available secondary and tertiary services. Holistic Medicine is a recognised speciality in many countries, but in our country we’ve not even initiated this globally recognised issue. As described above, Holistic Medicine integrates the ‘science’ of modern medicine with the ‘art’ of various drug-free modalities of the recognised AYUSH or the alternate or complementary systems of medicine including the traditional Chinese system of acupuncture. It helps to improve the final outcome of every sickness, adding ‘life-to-years’ of each person, and even helping to totally cure a vast majority of conventionally incurable ailments. Its results are highly predictable, reproducible and sustainable, thus qualifying it to be ‘scientific’. Besides, its practice is totally free of ‘iatrogenesis’ – fulfilling Hippocrates’ dictum “Primum Non-Nocere”, i.e., First Do No Harm. It enables to make the health services easily accessible and affordable at the level of primary care, as well as complementary at the secondary and tertiary levels of health making it far more efficient and sustainable. An early action needs to be initiated under the ‘SKILL INDIA’ programme to enlarge training of medical and paramedical workers in drug-free modalities of the alternate complementary systems of health at all levels of healthcare to extend its benefits to the last person. Let’s extend the already available rich expertise of alternate complementary systems of medicine at the grassroots without wasting time to re-invent the wheel. At the same time we must encourage multicentric pilot projects at the primary, secondary as well as tertiary levels to establish their scientific credibility. Immense thanks for highlighting the holistic approach in the treatment modalities as it forms the basis to treat the maladies by any discipline of medicine. Kudos.. Excellent article on the importance of spreading alternative system and integrating them in Health care delivery.